In one of the stranger developments of 2016, a fairly bog-standard remake (with a slight twist) has become a flashpoint for the culture, and something akin to a referendum on whether or not you are a good person. Congratulations, internet, you've now ruined everything, including the act of ruining things. For future generations who have survived the Gender Wars of 2016, let this document serve as a record of The World That Once Was. In whatever smoking crater you now reside in and on whatever scroll you are reading this on, know this: at one point the idea of an all-female Ghostbusters remake was considered innocuous, if possibly just a bit superfluous. Little did we know then that it would unleash the greatest controversy in movie history and annihilating society as we know it in a fit of backbiting and weapons-grade trollery. We apologize to you, the inheritors of this world, and bid you heed our mistakes, never again mistaking a piece of light entertainment for less than the world shaking issue that it is. But more seriously, the female-led Ghostbuster remake/reboot/rewhateverthehellyouwannacallit arrives this weekend buried neck deep in politics, thanks to a strange outrage campaign that Ghostbusters could possibly be remade with women in the lead roles (and just a bunch of SNL people too! Imagine!). When it was pointed out that the outrage reeked more than a little of misogyny, there was an attempt to make it a fight back against remake and reboot culture – which has some point to it, but is also a curious and convenient place to make your stand. I can think of a lot of worse reasons to remake a movie than because you want it gender-bent (take the reasons behind all of the FF movies, anyone?). And besides, let's not get all high and mighty about a franchise that includes Ghostbusters II, shall we? 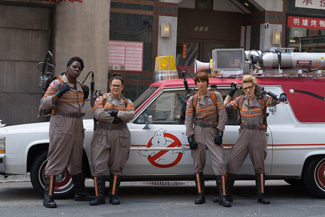 But stop me if you've heard this one: director Paul Feig teams up again with his muse Melissa McCarthy (playing Bill Murray-ish), Kristen Wiig (Ramis), Kate McKinnon (Akroyd) and Leslie Jones (Ernie Hudson) as a team of paranormal exterminators facing an infestation of ghouls and ghosts in New York City, with wacky and gross results ensuing, thanks to the help of their oddly attractive secretary, Chris Hemsworth (Annie Potts?). Now, this does all sound rather similar to the 1984 version, with a bit less swagger and a bit more awkwardness, but it would not be the first semi-pointless remake/reboot/sequel even this year. None of the criticism of the idea of a new Ghostbusters would have any legs at all were it not for a rather subpar initial trailer (though – watch the international trailer, it's miles better. Go ahead. I'll wait). Feig/McCarthy films have rarely trailered well though – Bridesmaids, The Heat and Spy all had initial impressions that were basically “meh,” but all turned out to be rather spectacular comedies, action- or otherwise. And lo and behold, later ads have been better, with mostly positive reviews rolling in. And while McCarthy and Wiig are fairly established presences on screen, this movie might be McKinnon's to steal, and what announces her as a major comic force to be reckoned with.